Uneeda must have issued the 6.5" Little Miss Dollikin to compete with Topper's Dawn. Unlike Dawn and her clones, LMD has a multi-jointed body, making her a distinct doll. 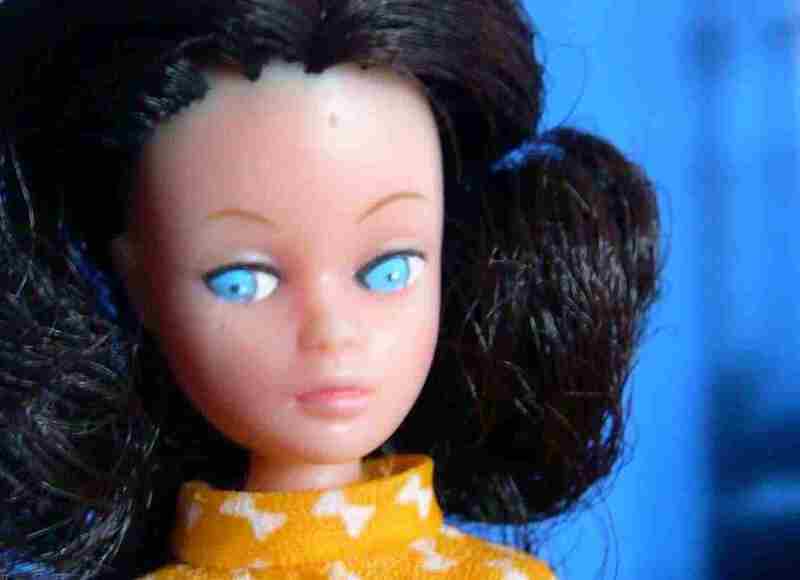 Descended from Uneeda's larger Dollikins, LMD is an active doll, rather than a static model type, at least in theory. While LMD is delightful to hold, she is too light in weight to be a proficient poser. Ultimately, this bowlegged, flail-armed flopper looks best lounging around. The 6.5" Uneeda dolls all have the same pale-blue-eyed face. It's a face that lacks expression, no matter what the variation, although the redheads do seem somewhat livelier. New! View my LMD reroots. LMD's otherworldly look practically begs for creative rerooting: Littlebloomer got great results giving LMD long pale pink hair and dressing her in a Pippa outfit done in kelly green with white, pink-centred flowers. 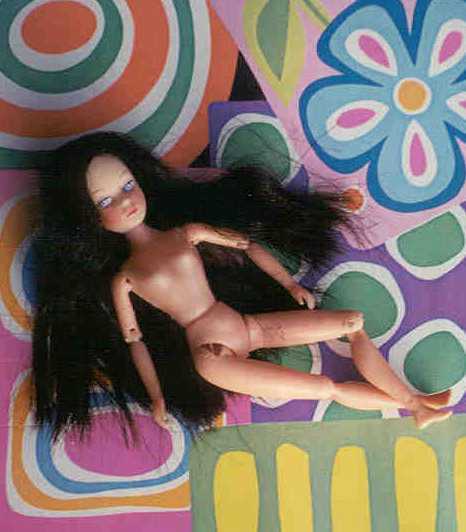 The 6.5" dolls are all marked "Little Miss Dollikin" on their backs, even if the doll is one of the Woolworths/Woolco variety called Triki Miki, which I will discuss on the next page. LMDs almost inevitably turn up barefoot at auction: their tiny pumps slip off so easily that most disappeared long ago in the shag carpeting of the 1970s rec room. A loose barefoot LMD or a Triki Miki (usually without sash) can be had on eBay for under ten dollars, depending on who is bidding. Mint-in-box LMDs also appear regularly and usually go for under twenty dollars apiece, barring a bidding war. Even when boxed, these little dolls are often shoeless. Three Little Miss Dollikins frequently appear mint-in-box on eBay. A blonde doll in a vibrant pink jumpsuit (illustrated at left) sports side-parted chin-length hair with a hard curl at the end. 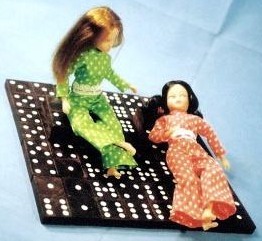 Pictured on the domino raft (below left) are the common redhead, who has waist-length hair parted in the middle and wears an apple-green jumpsuit, and the common black-haired LMD, who wears a bright orange jumpsuit with matching ribbon tied around her short poufy pigtails. 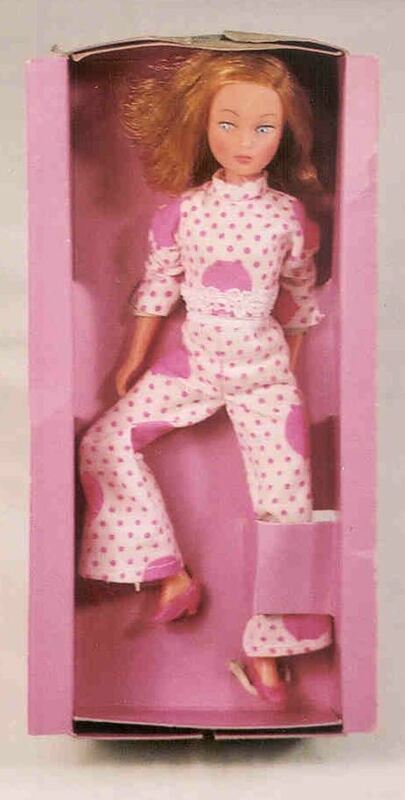 All these dolls come with low-heeled pumps coordinated with their jumpsuits. A fourth type of LMD does turn up loose from time to time. 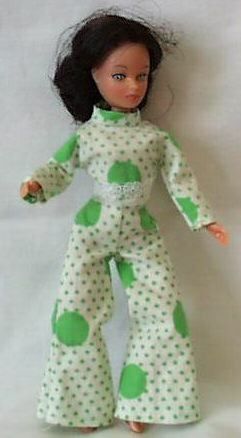 This doll has waist-length brown hair, side-parted, with a hard curl at the bottom. She is typically dressed as Triki Miki, but she may have also appeared in a rare red jumpsuit (as pictured above right). On the other hand, the doll with short black hair may be the real owner of the red suit, as she has worn it while MIB. 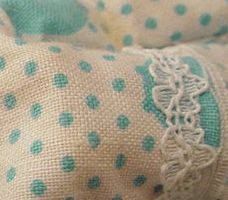 Little Miss Dollikin's original jumpsuit comes in three variations, each of which features a sewn-on lace cummerbund.The first, made of cotton, is either bright orange or apple green with small white polkadots. The second is made out of crepey polyester and features a white lozenge rather than a white polkadot pattern. This suit appears in a very rare golden yellow (near left), as well as in the vibrant pink and red versions illustrated above. 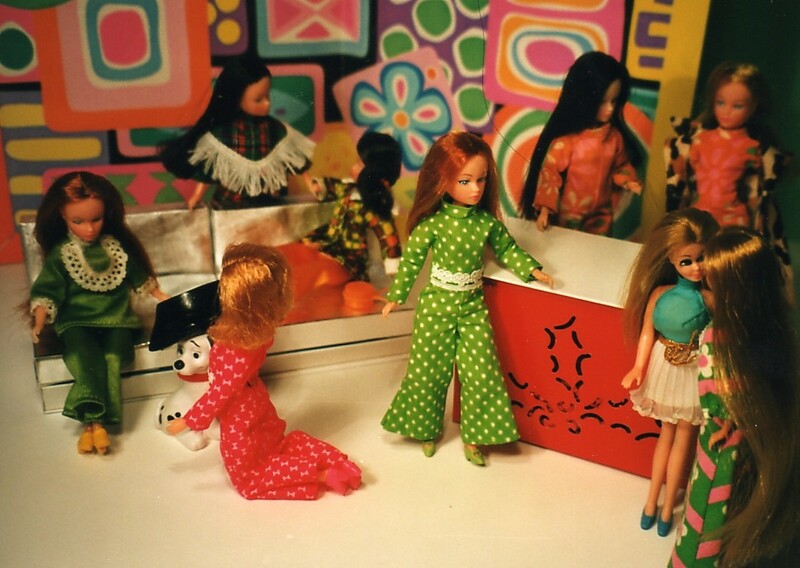 The third jumpsuit, illustrated here on two dolls, (far left and right), is made out of cotton and features a white background polkadotted in both small and giant dots. This suit comes in light blue, and medium pink and green versions. Do not fret if Little Miss Dollikin has come unstrung or is loose enough to warrant restringing. As long as the plastic holes atop her legs and the metal hooks on her arms are intact, you can easily restring her yourself. Please note that this method cannot be used to repair any of the other Dollikin dolls, which are constructed in a more complicated manner. 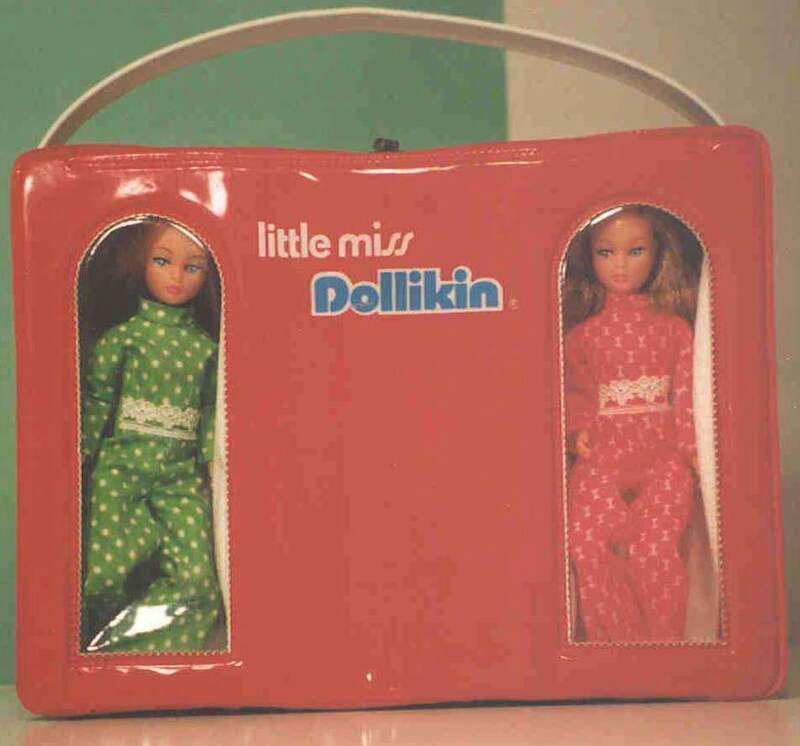 Despite the fact that Uneeda never issued any clothes for her, Little Miss Dollikin does have a wardrobe case, which I have seen in red and orange versions.